Greece has been facing accusations that it forcefully sends back illegal migrants to Turkey in a controversial practice known as "pushback." This time, the Aegean Sea that divides Turkey and Greece was the scene of such a pushback. Coast guard teams saved the migrants off Kuşadası district of southwestern Aydın province after a semi-submerged boat carrying the migrants including children started taking in water. Muhammad Fadel, father of nine-year-old Zainab, whose body was recovered by the Turkish Coast Guard, told reporters that Greek marines approached them while he and 45 other Iraqi migrants were heading to the Greek island of Samos from Kuşadası in western Turkey. "There were strong waves. We thought they came to save us. They told us to cut the engine. They tied our boat to theirs with a rope, and then they start to turn us in circles," Fadel told reporters as he was wrapped up in a blanket at a hospital in Kuşadası. 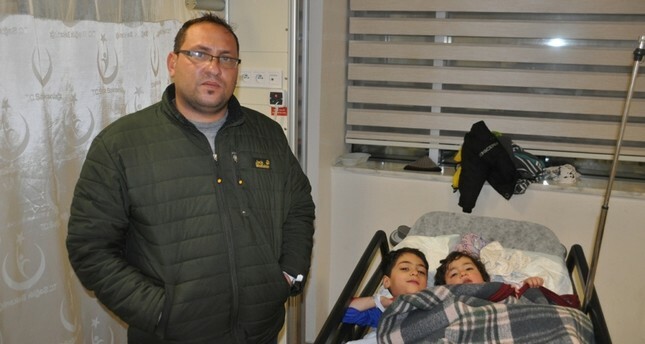 Fadel managed to pull his two other children to safety, while his wife Kawsar also survived "thanks to the Turkish Coast Guard" he said. Turkish officials said the boat was some 5 nautical miles off the Turkish coast when it started taking water. The Turkish Coast Guard dispatched boats and a helicopter to comb the area for potential survivors after the tragedy struck around 5:30 a.m. Search efforts ended when all survivors were accounted for. "I told them there were children aboard, but they wouldn't listen," a teary Muhammad Fadel told reporters. "There was too much water in the boat when they left us," he added. Greek law enforcement officers at the Maritsa River (Meriç in Turkish, or Evros in Greek) routinely return asylum seekers and migrants to Turkey, Human Rights Watch said in a report released in December on the notorious pushback practice. Four migrants were found frozen to death on the Turkish side of the border in the first week of December and eyewitnesses claimed they were victims of forcible return to Turkey by Greece. The Greek Coast Guard, or at least people disguised as Coast Guard officers were accused of forcing illegal migrants to the Turkish side in the past. Under international laws and conventions, Greece is obliged to register any illegal migrants entering its territory; yet, this is not the case for some migrants. Security sources say that accounts of migrants interviewed by Turkish migration authority staff and social workers show that they are forced to return to Turkey, where they arrived from their homelands with the hope of reaching Europe. Olga Gerovasili, Greece's minister for citizen protection whose ministry oversees border security, denied previous allegations of pushback and told Anadolu Agency (AA) that Greece is not involved in such incidents. Yet, figures provided to AA by Turkish security sources show many illegal migrants were forced to go back to Turkey by Greek officials, with some 2,490 migrants being pushed back in November alone. The agency reports that some 300 of them were subjected to mistreatment by Greek security forces, ranging from beatings to being forced to go back half naked to the Turkish side of the border. Turkey and the European Union signed a deal in 2016 to curb illegal immigration through the dangerous Aegean Sea route from Turkey to Greece. Under the deal, Greece sends back migrants held on Aegean islands after they crossed over from nearby Turkish shores, and in return, EU countries receive a number of Syrian migrants legally. The deal, reinforced with an escalated crackdown on human smugglers and more patrols in the Aegean, significantly decreased the number of illegal crossings. However, some desperate migrants still take the route, especially in winter months when a safe journey through the Aegean is nearly impossible aboard dinghies. Greece, which has struggled to cope with the huge influx of migrants, especially after the civil war in Syria displaced millions, has been criticized for decrepit conditions in refugee camps on its Aegean islands.